A House of Prayer? - Implications for the Church? Many of us know the account of Jesus entering the temple courts, overturning tables, and driving out buyers and sellers. What was Jesus Referring to as a House of Prayer? We can quickly identify what Jesus referred to as a House of Prayer. First, He walked into the courts of the Jewish temple. Second, He quoted Old Testament scripture related to the temple. He meant a literal, physical place. Though the temple could not literally contain God, it could display His glory and symbolically serve as a pattern of what was to come (Acts 7:47-50; Heb. 8:5). Think of the implications: As a place God would dwell, then the temple had to be a holy place filled with goodness (Ps. 65:4). Activity taking place within it had to honor and reflect Him. Why identify the temple as a house of prayer? 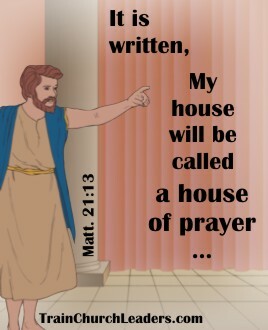 Jesus referenced Isaiah 56:7 when saying, “It is written … ‘My house will be called a house of prayer …'” That verse speaks of people going to His house where their burnt offerings and sacrifices would be accepted and pave the way for them to commune with a holy God. Prayer connected them with God. Prayer ushered them into His presence. With His presence came peace, joy, protection, and power. Think of the implications: The primary focus of a house of prayer should be about God’s presence and power. The building itself and all that’s done within it should honor and glorify Him. What about the Church as a house of prayer? We are the temple of God today in which His Spirit dwells (1 Cor. 3:16; 6:19; 2 Cor. 6:16; Eph. 2:19-22; 1 Pet. 2:4-5). Individually, or together, we can come boldly before His throne (Heb. 4:16). Where just two or three gather in Jesus’ name, He will be with us (Matt. 18:20). Think of the implications: We can pray without ceasing (1 Thess. 5:17) because of His constant presence. We always have access to His power. The whole of our lives should therefore honor and glorify God. Anything we do should reflect His holiness. The Church, ekklesia in the original Greek language, is the gathering together or assembling of those who have put their trust in Jesus and His atoning sacrifice. We call the place we meet together church but biblically speaking, the people are the Church. Nonetheless, since what Jesus referred to as a house of prayer was a literal, physical place, perhaps we should pause to consider any implications it might have on the literal, physical place we the Church, meet. Think of the implications: Shouldn’t we too want to make sure the primary focus when we come together is God’s presence and power? That means the building in which we meet and all that’s done within, as well as the lives of those in attendance, should honor and glorify God. Building Equals Making an Eternal Difference? Building Reflect the Glory of His Name? This entry was posted in Facilities.